Inside Out is a 2015 American 3D computer-animated comedy-drama film produced by Pixar Animation Studios and released by Walt Disney Pictures. The film was directed by Pete Docter and co-directed by Ronnie del Carmen, with a screenplay written by Docter, Meg LeFauve and Josh Cooley, adapted from a story by Docter and del Carmen. The film is set in the mind of a young girl named Riley (Kaitlyn Dias), where five personified emotions—Joy (Amy Poehler), Sadness (Phyllis Smith), Anger (Lewis Black), Fear (Bill Hader) and Disgust (Mindy Kaling)—try to lead her through life as she and her parents (Diane Lane and Kyle MacLachlan) adjust to their new surroundings after moving from Minnesota to San Francisco. Docter first began developing Inside Out in 2010, after noticing changes in his daughter's personality as she grew older. The film's producers consulted numerous psychologists including Dacher Keltner from the University of California, Berkeley, who helped revise the story by emphasizing the neuropsychological findings that human emotions affect interpersonal relationships and can be significantly moderated by them. After premiering at the 68th Cannes Film Festival on May 18, 2015, Inside Out was released in North America on June 19, 2015, accompanied by the short film Lava. The film was praised for its concept, screenplay, subject matter, Michael Giacchino's musical score, and the vocal performances (particularly those of Poehler, Smith, Black, and Richard Kind). The film grossed $90.4 million in its first weekend, making it the highest opening for an original title at the time, accumulating over $857 million in worldwide box office revenue in 2015, making it the seventh-highest-grossing film of 2015. The film received several awards, including a BAFTA Award, Golden Globe Award, Critics' Choice Award, Annie Award, Satellite Award, and Academy Award for Best Animated Feature. Riley is born in Minnesota. Within her mind's Headquarters, five personifications of her basic emotions — Joy, Sadness, Fear, Disgust, and Anger — come to life and influence her actions via a control console. As she grows up, her experiences become memories, stored in colored orbs, which are sent into long-term memory each night. Her five most important "core memories" (all happy ones) are housed in a hub; each powers an aspect of her personality which takes the form of floating islands. Joy acts as a de facto leader, and since she and the other emotions do not understand Sadness' purpose, she tries to keep Sadness away from the console. At the age of 11, Riley and her parents move to San Francisco for her father's new business. Riley has poor first experiences: the new house is cramped and old, the only pizza is pizza topped with broccoli, her father is under stress from his business, and the moving van with their belongings ends up in Texas and won't arrive for weeks. When Sadness begins touching Riley's happy memories, turning them sad, Joy tries to guard them by isolating her. On Riley's first day at her new school, Sadness accidentally causes Riley to cry in front of her class, creating a sad core memory. Joy, panicking, tries to dispose of it, but accidentally knocks the other core memories loose during a struggle with Sadness, deactivating the personality islands. Joy, Sadness, and the core memories are sucked out of Headquarters and taken to the maze-like storage area of long-term memory. Anger, Fear, and Disgust try to maintain Riley's happiness in Joy's absence with disastrous results, distancing her from her parents, friends, and hobbies. As a result, her personality islands gradually crumble and fall, one by one, into the "Memory Dump", an abyss where memories are forgotten. Finally, Anger inserts an idea into the console, prompting Riley to run away to Minnesota, believing that it will enable her to make new core memories. While navigating through the long-term memory region, Joy and Sadness encounter Bing Bong, Riley's childhood imaginary friend, who suggests riding the train of thought back to Headquarters. En route to the train station, Bing Bong tearfully watches his rainbow wagon rocket being thrown into the memory dump along with other unused childish artifacts. The three eventually catch the train, but it halts when Riley falls asleep, then derails entirely when "Honesty Island" collapses due to Riley's theft of her mother's credit card. In desperation, Joy abandons Sadness and tries to ride a "recall tube" back to Headquarters, but the ground below the tube collapses, breaking it and plunging Joy and Bing Bong into the Memory Dump. At the bottom of the abyss, Joy begins to lose hope and breaks into tears, but then discovers a sad memory of an ice hockey game that turned happy when Riley's parents and friends comforted her. Joy finally understands Sadness's purpose: to induce empathy in others, prompting them to reach out to Riley when she is emotionally overwhelmed and needs help. Therefore by preventing Riley from feeling sad, Joy was also keeping her from feeling true happiness. Joy and Bing Bong try to use the wagon rocket to escape the Memory Dump. After two failed attempts, Bing Bong, who is already fading away, jumps out to allow Joy to escape and is forgotten. Joy reunites with a despondent Sadness and takes them to Headquarters, only to discover that Anger's idea has disabled the console, rendering Riley apathetic. To the surprise of the others, Joy hands control of the console to Sadness, who is able to extract the idea, reactivating the console and prompting Riley to return home. As Sadness re-installs the core memories, turning them sad, Riley arrives home to her parents and tearfully confesses that she misses Minnesota and her old life. Her parents comfort her and admit they, too, miss Minnesota as much as she does. Joy and Sadness work the console together, creating a new amalgamated bittersweet core memory in Riley's Headquarters; a new island forms, representing Riley's acceptance of her new life in San Francisco. A year later at the age of 12, Riley has adapted to her new home, made new friends, and returned to her old hobbies while adopting a few new ones. Inside the Headquarters, her emotions all work together on a newly expanded console with room for them all. The film's crew, along with the English and French voice actors, attended the film's premiere at the 2015 Cannes Film Festival (from left): Lewis Black, Phyllis Smith, Mindy Kaling, Amy Poehler, Jonas Rivera, Marilou Berry, Pete Docter, Ronnie del Carmen, Mélanie Laurent, John Lasseter, Charlotte Le Bon, Pierre Niney, and Gilles Lellouche. Several of the filmmakers also contributed some voice acting, including director Pete Docter as Father's Anger, and co-writer Ronnie del Carmen as one of the abstract thought mind workers. As a child, director Pete Docter relocated with his family to Denmark when his father moved to study the music of Carl Nielsen. While his sisters had an easy time adjusting to the new surroundings, Docter felt he was judged constantly by peers. While other kids were interested in sports, Docter sat alone drawing, a hobby that eventually led him to animation. His social anxiety ended by high school. Paul Ekman served as a consultant of the film. In late 2009, Docter noticed his pre-teen daughter, Elie, exhibiting similar shyness. "She started getting more quiet and reserved, and that, frankly, triggered a lot of my own insecurities and fears," he said. He imagined what happens in the human mind when emotions set in. The idea to depict it through animation excited Docter, who felt it the ideal form to portray "strong, opinionated, caricatured personalities". He began researching information about the mind, alongside Jonas Rivera, a producer, and Ronnie del Carmen, a secondary director. They consulted Paul Ekman, a well-known psychologist who studies emotions, and Dacher Keltner, a professor of psychology at the University of California, Berkeley. Ekman had early in his career identified six core emotions—anger, fear, sadness, disgust, joy, and surprise. Docter found surprise and fear to be too similar, which left him with five emotions to build characters around. Other emotions considered for inclusion during the development process were schadenfreude, ennui, pride, and hope. Keltner focused on sadness being an emotion that strengthens relationships. Both emphasized how emotions organize social lives and the structuring of interpersonal interactions. The smash success of Docter's 2009 film Up encouraged those at Pixar to allow Docter to create another film with a more sophisticated story. Inside Out is the first Pixar film without input from co-founder and former Apple CEO Steve Jobs, who died in 2011. In addition, the film did not have as much input from chief creative officer John Lasseter, who was focused on restructuring Walt Disney Animation Studios in Burbank at the time of its production. Executives at Disney and Pixar were positive at the proposal of making Inside Out, but acknowledged it would be difficult to market. Docter recruited a story crew to help develop the film's plot line. Although animation as an industry had been dominated by men, half of the story crew were women, in an attempt to have more diverse input. The choice to focus the film on a girl came from research that claimed that females age 11 to 17 are more attuned to expressions and emotions than others. The idea to have Riley play hockey came from Del Carmen, who observed that the sport is very popular in Minnesota. Initial ideas for the film found the main character, Riley, falling into a deep depression: Docter later felt they were inappropriate and scrapped them, although in the final film Riley does sink into a depression. The film was first storyboarded over a period of two to three years, all the while undergoing screenings for Pixar's "Brain Trust", a small group of creative leaders at Pixar who oversee development on all films. After multiple screenings and suggestions from other filmmakers, the picture was put into production. It was again evaluated three months into that process. Kevin Nolting, editor of the film, estimated there were seven versions of Inside Out created before it even went into production. The story team attempted to create as much contrast with characters as possible. They found Joy the most complex character to write for, as she illustrates a broad range of "happy feelings". The earliest idea present in the final film is that Joy holds onto youth too long, setting about a "social storm" for Riley. It was not until several screenings later that they came upon the concept of moving to a new place, which created an external conflict that made the story easier to write. Initially, this crisis was to be set at a Thanksgiving Day pageant, in which Riley was hoping to be cast as its lead role, the turkey. Docter later deemed this idea too "bizarre" and it was replaced. Docter estimated it took four years of development for the film to achieve success in marrying the architecture of Riley's mind and her personal troubles. The concept of "personality islands" helped develop the film's emotional stakes, as they directly affect events inside her mind and in her life. In one draft, the characters fell into "Idea Fields", where they would "cultivate new ideas", much like a farmer would cultivate crop. The character of Bing Bong—a discarded old imaginary friend—came about in one draft of the film as part of a refugee camp inside Riley's mind. It was difficult to achieve the correct tone for the film; for example, viewers could not be distracted by Joy's nature or feel negative about the mess she helps steer Riley into. 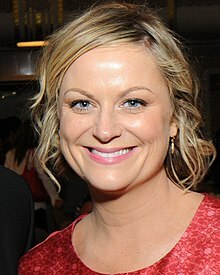 Rivera credited the casting of Amy Poehler, in addition to the idea of moving, with helping the film find the right tone. An early version of the film focused on Joy and Fear getting lost together, as it seemed to be the most humorous choice. By July 2012, the project was set for an evaluation screening with other Pixar filmmakers. Docter gradually began to feel that the story was not working, which made him think that he might get fired. He took a long walk one Sunday, where he began to consider himself a failure, and that he should resign from the film. While pondering what he would miss about Pixar, he concluded that he would miss his coworkers and friends most of all. He soon reached a breakthrough: that emotions are meant to connect people together, and that relationships are the most important things in life. He decided to replace Fear with Sadness, which he felt is crucial to renewal. He met with Rivera and Del Carmen that night to explain his change of plans, and to his surprise, they reacted positively to it. At the screening, he informed his superiors that new plans for the film were in order. Although it was a "scary moment", the film remained in production. Screenwriter Michael Arndt initially worked for a year on the film's script, calling it "both a brilliantly creative idea but also incredibly challenging", but left the project in early 2011, adding that "knowing the Pixar process, there may not be a single word [I wrote] that remains in the final script! They've had writers work on it since then." Josh Cooley and Meg LeFauve were credited as co-writers of the screenplay following their contributions during the rewrite. Like Docter, Cooley and LeFauve included experiences with raising their own children into the screenplay. Cooley said "… we treated the emotions like parents for Riley and because all of us in the writing room are parents ourselves, we just reflected on our own experiences as parents to create the characters." Despite his departure, Arndt received an 'Additional Story Material' credit. The film's voice cast of emotions, Amy Poehler, Lewis Black, Mindy Kaling, Bill Hader, and Phyllis Smith, were first announced in August 2013. With the release of the film's trailer in December 2014, it was revealed that Diane Lane and Kyle MacLachlan were cast in the film as Riley's parents. Hader, who had previously cameoed in Monsters University, was cast to voice Fear, a role that he felt he "weaseled" his way into by being a "huge fan" of Pixar's filmography. Hader toured the studio over a week, and also "helped out" in the story room. He was invited to play Fear by the end of his stay there, but was also asked to contact fellow Saturday Night Live (SNL) veteran Amy Poehler, whom the team viewed as perfect for the character of Joy. "They said: 'Would you mind calling Amy? We don't want to call her and have her think we're some weirdo,'" he recalled. He phoned Poehler and explained the story to her, noting that her role would be the driving force in the film. When the story was pitched to Kaling, she broke down in tears, explaining "I just think it's really beautiful that you guys are making a story that tells kids that it's difficult to grow up and it's OK to be sad about it." Smith was chosen by Rivera while he was watching Bad Teacher and saw her in a lunch scene. He called Docter and said "I think we found our Sadness." As the film contains several veterans of SNL, the film's team spent a week at that program for research on a live television sequence. Richard Kind, who had previously starred in A Bug's Life, the Cars series, and Toy Story 3, portrayed Bing Bong. Kind tried to convey the same "sort of innocence" of his previous Pixar roles, and wound up not taking part in pre-release promotion as the producers decided to keep the character a secret. The film's art design is intended to reflect 1950s Broadway musicals. Docter imagined that with emotions for characters, they could "push the level of caricature both in the design and in the style of movement to degrees [they'd] never done before". To this end, they emulated animators Tex Avery and Chuck Jones. Docter informed supervising animators Shawn Krause and Victor Navone to push the graphic caricature of each character rather than sticking to the rigid behavior of each RenderMan model. This required an artist to draw over characters in the film during dailies, using a Wacom Cintiq. One of the first scenes the team worked on was the dinnertime scene, in which viewers rapidly switch between the real world and Headquarters inside the family's minds. In envisaging how the mind's interior would be depicted, the filmmakers concentrated on the word electrochemical; Ralph Eggleston, the film's production designer, explained, "It meant thinking of things as energy or energy-based, excitable." Each emotion has a glowing, "effervescent quality" to them (particularly Joy), which was difficult to animate as it could be viewed as distracting. "The characters are created with this energy because we are trying to represent what emotions would look like. They are made up of particles that actually move. Instead of being skin and solid, it is a massive collection of energy," Docter remarked. The team worked for eight months on Joy's "sparkly" aura, but was prepared to delete it, as it would affect the film's budget. However, Lasseter requested that it be applied for each emotion. "You could hear the core technical staff just hitting the ground, the budget falling through the roof," recalled Eggleston. The film is localized to accommodate international audiences: in the Japanese version, for example, Riley is disgusted by green bell peppers, rather than by broccoli (the only topping offered by the local pizzeria), to reflect the fact that broccoli is generally less undesirable to Japanese children. Michael Giacchino composed the film's score; this was his fifth collaboration with Pixar and his second collaboration with Docter after Up. The producers first met with Giacchino to explain the film's concept and screen it for him. In response, he composed an eight-minute suite of music, unconnected to the film, based on his emotions viewing it. Rivera noted that while both Giacchino and Docter were musicians, they discussed the film in terms of story and character. Walt Disney Records released the soundtrack on June 16, 2015. Inside Out was first announced in August 2011 at the D23 Expo. 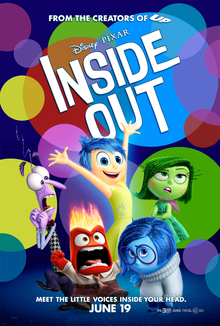 In December 2012, Bleeding Cool reported the title of the film would be The Inside Out, while ComingSoon.net reported it would be Inside Out the following February. In April 2013, Disney officially announced the title on Twitter as Inside Out, during CinemaCon. Prior to its release, the film underwent a test screening for children, due to concerns from executives that it would be too complex for younger audiences—a fear quelled when the audience reacted positively to the picture. The film premiered on May 18, 2015, at the 68th Cannes Film Festival, in an out-of-competition screening. In the United States, it premiered on June 8, 2015, at the El Capitan Theatre in Hollywood, and received a wide theatrical release starting on June 19, 2015, in 2D, 3D, and select IMAX 3D theatres. It was the first animated movie to be released in Dolby Vision format in Dolby Cinema and the second for Disney following Tomorrowland. Also notable was the fact that it was one of two feature films (the other being The Good Dinosaur) released by Pixar in the same calendar year, a first for the company. A short animated film, titled Lava, accompanied Inside Out during its theatrical release. This musical love story was directed by James Ford Murphy and produced by Andrea Warren. The story was inspired by the isolated beauty of tropical islands and the explosive allure of ocean volcanoes, and takes place over millions of years. On June 18, 2015, Skype added faces of the five "emotions" of the film as emoticons available for use in its IM service for the next three months, later leaving them as standard. Inside Out was released by Walt Disney Studios Home Entertainment on Blu-ray (2D and 3D) and DVD on November 3, 2015, while a digital release was released on October 13, 2015. The Pixar's theatrical short, Lava, was included. A short film set in the world of Inside Out, titled Riley's First Date?, and directed by Josh Cooley, the head of story on the film, was included exclusively in the Blu-ray and the digital release. An Inside Out play set featuring all five emotions as playable characters was made available for Disney Infinity 3.0. A mobile game, Inside Out: Thought Bubbles, was released on June 18, 2015, by Disney Mobile Games on Apple App Store, Google Play, Amazon Appstore, Windows Store, and Windows Phone Store. Playing as Riley's emotions, players have to match and sort memory bubbles through 485 levels (as of May 2016[update]) inspired by the film's locations. Inside Out grossed $356.5 million in the USA & Canada and $501.1 million in other countries, for a worldwide total of $857.6 million against a budget of $175 million. Deadline Hollywood calculated the net profit of the film to be $279.51 million, when factoring together all expenses and revenues for the film. Worldwide, it is the seventh-highest-grossing film of 2015 (placing second among animated films behind only Minions), the fourth-highest-grossing Pixar film, and the thirteenth-highest-grossing animated film of all time. Inside Out opened across 3,946 theaters in the United States and Canada, of which 3,100 showed the film in 3D. It grossed $3.7 million during its Thursday night showings. This was a record among Pixar films that had Thursday night showings, but behind Toy Story 3's $4 million midnight showing. The film then earned $34.3 million on its opening day, which is the third largest opening day for a Pixar film behind Toy Story 3 ($41.1 million) and Finding Dory ($54.7 million). It ended its opening weekend in second place with $90.4 million, behind the second-weekend gross of dinosaur thriller Jurassic World ($106.6 million). Although it was Pixar's first film not to debut at No. 1, its opening-weekend gross was still the biggest for a Pixar original film (breaking The Incredibles' record), the studio's third-biggest of all time (behind Finding Dory and Toy Story 3), the biggest weekend debut for a film that did not debut at No. 1 (breaking The Day After Tomorrow's record), and the top opening for any original film, live-action or otherwise, not based on sourced material, eclipsing the $77 million debut of Avatar (overtaken by The Secret Life of Pets). The film's successful opening has been attributed to its Cannes premiere, CinemaCon press screening, its critical reception (particularly the 98% Rotten Tomatoes score), good word-of-mouth, Father's Day weekend, and a successful Tuesday-night Fathom screening. In its second weekend, the film fell by 42% to $52.3 million and still held the second spot behind Jurassic World; the rest of the week saw it slightly ahead of the latter. Inside Out reached the No. 1 spot at the box office in its third weekend, which was Independence Day weekend, with $29.8 million. Overall, IMAX contributed 10% or $36 million (as of September 4, 2015[update]) of its total North American revenue. It ended up grossing a total of $356.5 million and became the third-highest-grossing Pixar film (behind Finding Dory and Toy Story 3), the fourth-highest-grossing film of 2015, the ninth-highest-grossing animated film of all time (the highest of 2015), and the 35th-highest-grossing film of all time. Outside the US and Canada, the film earned an estimated $40.3 million on its opening weekend from 37 countries, which is 42% of the entire international market. Its largest openings were recorded in China ($11.7 million); the UK, Ireland and Malta ($11.4 million); Mexico ($8.6 million), Russia and the CIS ($7.6 million), Italy ($7.4 million), Germany ($7.1 million), and South Korea ($5.1 million). In total earnings, its largest markets outside the U.S. and Canada are the United Kingdom ($58.1 million), South Korea ($31.7 million), and Mexico ($31 million). It became the highest-grossing Disney animated or Pixar film of all time in Mexico (ahead of Frozen), the Philippines (ahead of Big Hero 6), India, and Ukraine and in Russia, it is the second-highest-grossing Disney or Pixar film and the first Pixar film to exceed one billion rubles. Review aggregator website Rotten Tomatoes gives the film a rating of 98%, based on 350 reviews, with a rating average of 8.93/10, which, as of January 2018[update], makes it the highest-rated animated film of all time. The website's critical consensus reads, "Inventive, gorgeously animated, and powerfully moving, Inside Out is another outstanding addition to the Pixar library of modern animated classics." The film also topped the site's Top 100 Animation Movies list and occupies the third-highest position of a film released in the 21st century on the Top 100 Movies of All Time list at number 8. On Metacritic the film has a score of 94 out of 100, based on 55 critics, indicating "universal acclaim". In CinemaScore polls, cinema audiences gave Inside Out an average score of "A" on an A+ to F scale. Prior to its release, there was concern among the general public that Pixar films were declining in quality, with an over-reliance on sequels. Likewise, DreamWorks Animation was beginning to flounder in the early 2010s as several films performed below expectations at the box office, leading to speculation that the "genre" of computer animation was "in a funk". Inside Out has been hailed as a return to form for Pixar by numerous film critics. Poehler's vocal performance was praised by critics. Following an advance screening at CinemaCon on April 22, 2015, the film was well received by audiences. Praise was aimed for its smart storyline, although some wondered whether the concept was too complicated for young audiences and to attract family crowds. After premiering at the 2015 Cannes Film Festival, the film attracted praise from film critics. Peter Debruge of Variety was effusive, calling it the studio's "greatest idea" and "a stunningly original concept that […] promises to forever change the way people think about the way people think". The Chicago Tribune's Michael Phillips called it the studio's best since Up (also directed by Docter), a "consistently inventive and a heartening corrective to recent, stockholder-driven inferiorities". Todd McCarthy of The Hollywood Reporter deemed it an "audacious concept" that stands among the most "conceptually trippy films" for family audiences. "With its quite literally cerebral bent, I think Inside Out might have some trouble fully connecting with younger kids, but grown-ups are likely to shed more than a few tears," remarked Richard Lawson of Vanity Fair. The Guardian's Peter Bradshaw felt it "buoyant and sweet-natured", though slightly inferior to Pixar's best. Ignatiy Vishnevetsky of The A.V. Club, while overall positive on the film, said it "trades the wordless gracefulness and sense of discovery of the animation studio's best work for explanatory voice-over and nonstop exposition", also arguing that the Pixar animators could have been more visually adventurous to match the conceptual ambition. Kristopher Tapley of HitFix called it as "one of the best films of the 21st century". A. O. Scott of The New York Times deemed the film "an absolute delight", reserving particular praise for its "defense of sorrow, an argument for the necessity of melancholy dressed in the bright colors of entertainment". The Washington Post's Ann Hornaday considered it "that rare movie that transcends its role as pure entertainment to become something genuinely cathartic, even therapeutic, giving children a symbolic language with which to manage their unruliest emotions". Richard Roeper of the Chicago Sun-Times found it "bold, gorgeous, sweet, funny, [and] sometimes heartbreakingly sad", deeming it one of the best films of the year. Entertainment Weekly's Chris Nashawathy extolled it as "transcendent and touching […] so smart and psychologically clever". Time's Mary Pols felt it a "nearly hallucinogenic, entirely beautiful" work that "defies the conventions of family movies". Christopher Orr of The Atlantic urged readers to view the picture, calling it "Pixar once again at the top of its game, telling the kind of thoughtful, moving meta-story it's hard to imagine being produced anywhere else". Wai Chee Dimock in the Los Angeles Review of Books compared the film to the work of neuroscientists Antonio Damasio, Dacher Keltner, and Oliver Sacks. Betsy Bozdech of Common Sense Media gave the movie 5 stars, stating that "'Inside Out' is creative, clever, heartfelt, and beautifully animated." Inside Out received fifteen Best Picture, twenty-one Best Original Screenplay, and forty Best Animated Feature nominations from over 50 different organizations and associations. It won the Academy Award for Best Animated Feature and was nominated for the Academy Award for Best Original Screenplay at the 88th Academy Awards held in 2016. It received ten out of fourteen Annie Awards at the 43rd Annie Awards, including Outstanding Achievement in Directing in an Animated Feature Production for Docter, Outstanding Achievement in Voice Acting in an Animated Feature Production for Smith and Best Animated Feature. The American Film Institute selected Inside Out as one of the Top Ten Films of the Year. The film received the Golden Globe Award for Best Animated Feature Film at the 73rd Golden Globe Awards. It received three Critics' Choice Movie Award nominations including the win for Best Animated Feature. The New York Film Critics Circle awarded Inside Out for Best Animated Film and it was named Film of the Year by National Board of Review with also winning Best Animated Film. The film was runner-up for Best Animated Film at Los Angeles Film Critics Association Awards and at San Diego Film Critics Society Awards. It received four nominations from Satellite Awards including Best Original Screenplay, Best Animated or Mixed Media Feature, and Best Original Score. It took the Satellite Award for Best Animated or Mixed Media Feature. The film won the award for Best Animated Film at the 69th British Academy Film Awards in London, England, and was also nominated for Best Original Screenplay (losing to Spotlight). The film also received a Robert Award for Best American Film nomination and a David di Donatello for Best Foreign Film nomination, the Danish and Italian equivalent of the Academy Awards, respectively. In 2016, the film was ranked at number 41 on BBC's 100 Greatest Films of the 21st Century list, a poll of 177 film critics from around the world. It was also named the seventh "Best Film of the 21st Century So Far" in 2017 by The New York Times. On June 24, 2015, when asked if there are plans for a possible sequel, Pete Docter replied, "There's no sequel idea from me at this point," adding, "Never say never." On January 14, 2016, Docter stated that a sequel is possible, and that he and Pixar will explore ideas, saying: "We'll see if anything turns up. To me it's not as simple as: 'We liked it, so let's make another one.' What happens is you design these characters not so much looks-wise but as they are as characters and people for a story. So we'll explore it and see what happens." In a July 2016 interview, Pixar president Jim Morris said that while demand for a sequel is high, the company has committed its resources to several original movie concepts from June 7, 2019, onward, and that no sequels to any of Pixar's other films, including Inside Out, were being contemplated at this time. On June 20, 2017, Denise Daniels, a child psychologist from Minnesota, filed a lawsuit against Disney and Pixar for breach of contract. Daniels had been working on a creative project, The Moodsters, with a theme very similar to Inside Out and had discussed prospects of a TV production with Disney and Pixar executives, including with the film's eventual director Pete Docter. Daniels claims that she presented in detail her idea for five color-coded characters representing happiness, sadness, anger, love and fear, who would live in an abstract world within a child. The discussions were held between 2006 and 2009, and Daniels argued that they carried an implied contract for her to be compensated if the ideas were used by Disney. On January 31, 2018, her suit was dismissed by judge Philip Gutierrez, who ruled that since Daniels had released materials related to the project publicly at the time of the conversations, there were no grounds for an implied contract between Disney and Daniels. ^ "Michael Giacchino to Score Pixar's 'Inside Out'". Film Music Reporter. May 25, 2014. Archived from the original on May 29, 2014. Retrieved June 2, 2014. ^ a b Todd McCarthy (May 18, 2015). "'Inside Out': Cannes Review". The Hollywood Reporter. Prometheus Global Media. Retrieved May 18, 2015. ^ a b c "Inside Out (2015)". Box Office Mojo(IMDb). Retrieved August 20, 2016. ^ Lang, Brent (June 17, 2015). "Box Office: 'Inside Out' Won't Stop 'Jurassic World' Rampage". Variety. Penske Media Corporation. Archived from the original on June 18, 2015. Retrieved June 18, 2015. ^ J. Wesley Judd (July 8, 2015). "A Conversation With the Psychologist Behind 'Inside Out'". Pacific Standard. Miller-McCune Center for Research, Media and Public Policy. Retrieved July 9, 2015. ^ a b Keltner, Dachner; Ekman, Paul (July 3, 2015). "The Science of 'Inside Out'". The New York Times. Retrieved January 25, 2016. ^ a b Devan Coggan (June 21, 2015). "Box office report: Inside Out scores biggest original debut ever with $91 million". Entertainment Weekly. Retrieved June 21, 2015. ^ a b c d e f "D23 Expo: New Art From the Upcoming Disney, Pixar and Disneytoon Movies". ComingSoon.net. August 9, 2013. Retrieved August 13, 2013. ^ a b Hornaday, Ann (June 18, 2015). "'Inside Out' mixes adventure and brain science to create a literal joy ride". The Washington Post. Retrieved June 19, 2015. ^ a b c Bryan Alexander (December 8, 2014). "Parents speak their mind in Pixar's 'Inside Out'". USA Today. Retrieved December 8, 2014. ^ a b c d e f g h i j k "Pixar's 'Inside Out' Cast Includes Some Awesome Voice Cameos (Spoilers)". Stitch Kingdom. May 20, 2015. Archived from the original on May 22, 2015. Retrieved May 22, 2015. ^ a b "Inside Out press kit" (PDF). The Walt Disney Studios. May 20, 2015. Retrieved May 28, 2015. ^ Mendelson, Scott (February 1, 2015). "Pixar's 'Inside Out' Puppy Bowl Ad Plays on Your Emotions". Forbes. Retrieved March 20, 2015. ^ a b c d e f g h i Barnes, Brooks (May 20, 2015). "'Inside Out,' Pixar's New Movie From Pete Docter, Goes Inside the Mind". The New York Times. Emeryville, California. Retrieved June 16, 2015. ^ Anne Thompson (June 16, 2015). "Why Pete Docter's 'Inside Out' Was So Tough to Make into Must-See Pixar". IndieWire. Retrieved June 16, 2015. ^ a b Susan Wloszczyna (June 11, 2015). "Why Pixar Whiz Pete Docter Decided to Enter a Young Girl's Mind -- and Turn Your Emotions Inside Out". IndieWire. Retrieved June 16, 2015. ^ Terry Flores (June 10, 2015). "'Inside Out' Director Pete Docter Talks About Animation Influences, Pixar at LAFF Master Class". Variety. Penske Media Corporation. Retrieved June 16, 2015. ^ a b c d e Terry Gross (June 10, 2015). "It's All in Your Head: Director Pete Docter Gets Emotional In 'Inside Out'". Fresh Air, NPR. Retrieved June 16, 2015. ^ a b McKittrick, Christopher (February 16, 2016). ""Is this the best story we can tell?" – Inside Out". Creative Screenwriting. Retrieved February 16, 2016. ^ a b Rebecca Keegan (May 18, 2015). "Pete Docter turns expectations upside-down with 'Inside Out' for Pixar". Los Angeles Times. Retrieved June 16, 2015. ^ a b Giardina, Carolyn (June 19, 2015). "'Inside Out' Editor Reveals Pixar's Secret to Making Moviegoers Cry". The Hollywood Reporter. Prometheus Global Media. Retrieved June 20, 2015. ^ a b Lisa Miller (June 16, 2015). "How Inside Out Director Pete Docter Went Inside the 11-Year-Old Mind". Vulture. New York. Retrieved June 16, 2015. ^ a b Drew Taylor (June 19, 2015). "'Inside Out' Producer Jonas Rivera Reveals Versions of the Movie You'll Never See". MovieFone. Archived from the original on June 21, 2015. Retrieved June 20, 2015. ^ a b c d e Germain Lussier (June 20, 2015). "Pete Docter and Jonas Rivera Talk 'Inside Out' Struggles, Score, Parks And Pixar Pressures". Slashfilm. Retrieved June 20, 2015. ^ Alloway, Meredith (April 6, 2014). "Oscar winner Michael Arndt talks screenwriting, and offers some advice". The Script Lab. Retrieved March 28, 2015. ^ Breznican, Anthony (August 9, 2013). "Pixar preview: Casts revealed for 'Finding Dory,' 'The Good Dinosaur,' 'Inside Out' at Disney's D23". Entertainment Weekly. Retrieved August 13, 2013. ^ a b Jacqueline Andriakos (June 9, 2015). "Bill Hader Says He 'Kind of Stalked' Pixar Folks to Snag a Role in Inside Out". People. Retrieved June 16, 2015. ^ a b Michael Cavna (June 15, 2015). "Pixar's 'Inside Out': How 'anxious' Bill Hader embraced becoming Fear itself". The Washington Post. Retrieved June 16, 2015. ^ Dickey, Josh (November 17, 2014). "The first character poster from Disney/Pixar's 'Inside Out': Sadness". Mashable. Retrieved December 24, 2014. ^ Terrero, Nina (June 28, 2015). "How Richard Kind turned Bing Bong into the summer's heartbreaking imaginary best friend". Entertainment Weekly. Retrieved January 24, 2016. ^ Desowitz, Bill (June 5, 2015). "Immersed in Movies: Going 'Inside Out' with Producer Jonas Rivera". IndieWire. Retrieved June 20, 2015. ^ Murphy, Mekado (June 17, 2015). "Pixar's 'Inside Out' Takes a Journey to the Center of the Mind". The New York Times. Archived from the original on June 17, 2015. Retrieved June 21, 2015. ^ a b Robinson, Melia (June 16, 2015). "Pixar blew through its 'Inside Out' budget to create the biggest effect in the movie". Business Insider. Retrieved June 16, 2015. ^ Giardina, Carolyn (July 22, 2013). "Siggraph: Pixar's Pete Docter Reveals the Challenges of His Next Film 'Inside Out'". The Hollywood Reporter. Retrieved August 13, 2013. ^ Acuna, Kirsten (July 31, 2015). "Why Pixar changed several scenes in 'Inside Out' for foreign audiences". BusinessInsider.com. Archived from the original on July 31, 2015. Retrieved August 31, 2015. ^ "'Inside Out' Soundtrack Details". Film Music Reporter. May 27, 2015. Retrieved April 29, 2017. ^ "Inside Out Soundtrack". Amazon.com. Retrieved April 29, 2017. ^ Connelly, Brendon (December 2, 2012). "The Next Film From The Director of Up And Monsters Inc. Is Called The Inside Out – At Least For Now". Bleeding Cool. Retrieved August 13, 2013. ^ Douglas, Edward (February 8, 2013). "Confirmed: Pete Docter's Next Pixar Film Called Inside Out". ComingSoon.net. Retrieved August 13, 2013. ^ Hammond, Pete (April 22, 2015). "DIsney Loves All Its Brands, But Pixar Steals Show With 'Inside Out' Debut – CinemaCon". Deadline Hollywood. Retrieved August 13, 2015. ^ Gettell, Oliver (May 11, 2015). "Cannes 2015: Studios to drop in with 'Mad Max,' 'Inside Out'". Los Angeles Times. Retrieved May 16, 2015. ^ Flores, Terry (June 9, 2015). "Lewis Black, John Lasseter Share Their Core Memory Islands at 'Inside Out' Premiere". Variety. Retrieved June 9, 2015. ^ Wolfe, Jennifer (April 18, 2013). "Pixar's Inside Out Gets Official Announcement". Animation World Network. Retrieved August 13, 2013. ^ "Inside Out An IMAX 3D Experience". IMAX. Retrieved June 17, 2015. ^ Carolyn Giardina (July 22, 2015). "'Hunger Games,' 'Pixels,' 'Everest' Among Upcoming Dolby Cinema Titles". The Hollywood Reporter. Prometheus Global Media. Retrieved July 22, 2015. ^ Emery, Debbie (June 9, 2014). "Pixar's Short Film 'Lava' Announced". The Hollywood Reporter. Retrieved June 6, 2015. ^ "Disney's "Inside Out" Emoticons Launch on Skype Today: Express Your Feelings with Our New Emoticons". Skype Big Blog. June 18, 2015. Retrieved July 10, 2015. ^ "REPORT: Pixar's 'Inside Out' on Blu-ray on November 3". Stitch Kingdom. August 5, 2015. Archived from the original on August 8, 2015. Retrieved August 6, 2015. ^ "Exclusive: Riley From Disney-Pixar's 'Inside Out' Returns in New Animated Short, 'Riley's First Date?'". ABC News (America). August 13, 2015. Retrieved August 14, 2015. ^ a b "Inside Out 3D (Includes 2D Version + EXCLUSIVE BONUS DISC!) - Zavvi Exclusive Limited Edition Steelbook Blu-ray Blu-ray". Zavvi.com. Retrieved August 5, 2015. ^ Solomon, Charles (March 10, 2015). "10 Animators to Watch - Josh Cooley". Variety. Penske Media Corporation. Retrieved March 11, 2015. ^ "Inside Out Special Features Comparison (Blu-ray 3D / Blu-ray / DVD / Digital HD Versions)". DVDBlurayFeatures.com. Retrieved March 15, 2016. ^ Inside Out Play Set - Disney Infinity 3.0 Edition. YouTube. May 28, 2015. ^ ""Inside Out Thought Bubbles" Launches for iOS, Android and Windows Devices". Disney Interactive. June 18, 2015. Retrieved August 20, 2015. ^ Mike Fleming Jr (March 23, 2016). "No. 6 'Inside Out' – 2015 Most Valuable Movie Blockbuster Tournament". Deadline Hollywood. Retrieved March 24, 2016. ^ "2015 Yearly Box Office Results". Box Office Mojo. Retrieved March 16, 2016. ^ a b "Pixar Movies at the Box Office". Box Office Mojo. Retrieved March 16, 2016. ^ Scott Mendelson (June 19, 2015). "Box Office: 'Inside Out' Dreams Up Huge $3.7M Thursday, Aims For Top #2 Debut Ever". Forbes. Retrieved September 6, 2015. ^ a b Simanton, Keith (June 20, 2015). "Friday Report: 'Inside Out' 2nd Best but Beats 'Jurassic'". Box Office Mojo. Retrieved June 21, 2015. ^ Pamela McClintock; Aaron Couch (June 19, 2015). "Box Office: 'Inside Out' Devours 'Jurassic World' Friday With $34.2M". The Hollywood Reporter. Prometheus Global Media. Retrieved June 20, 2015. ^ Scott Mendelson (June 18, 2016). "Pixar's 'Finding Dory' Finds Record-Crushing $55 Million Friday". Forbes. Retrieved August 11, 2016. ^ Simanton, Keith (June 22, 2015). "'Jurassic' Rex Records". Box Office Mojo. Retrieved June 24, 2015. ^ "BIGGEST OPENING WEEKENDS NOT AT #1". Box Office Mojo. Retrieved June 22, 2015. ^ Pamela McClintock (June 21, 2015). "Box Office: 'Inside Out' Hits Record $91M; 'Jurassic World' No. 1 With $102M". The Hollywood Reporter. Prometheus Global Media. Retrieved June 21, 2015. ^ Pamela McClintock (July 10, 2016). "Box Office: 'Secret Life of Pets' Bites Off Huge $103.2M Opening". The Hollywood Reporter. Retrieved July 10, 2016. ^ Anthony D'Alessandro (June 21, 2015). "A T-Rex-fic Weekend: 'Jurassic World', 'Inside Out' Drive Second Biggest 2015 Frame To Date With $240M". Deadline Hollywood. Penske Media Corporation. Retrieved June 21, 2015. ^ Brent Lang (June 21, 2015). "Box Office: 'Jurassic World' Bites Into $102 Million, 'Inside Out' Scores With $91 Million". Variety. Penske Media Corporation. Retrieved June 21, 2015. ^ Simanton, Keith (June 28, 2015). "'Jurassic' Holds Off Challengers". Box Office Mojo. Retrieved July 1, 2015. ^ "Daily Box Office for Thursday, July 2, 2015". Retrieved July 5, 2015. ^ Simanton, Keith (July 6, 2015). "'Inside' Holds Out for #1". Box Office Mojo. Retrieved July 6, 2015. ^ Anthony D'Alessandro (September 4, 2015). "Summer Box Office Poised To Be 2nd-Best Ever, So Why Isn't Everybody Happy?". Deadline Hollywood. Penske Media Corporation. Retrieved September 6, 2015. ^ "2015 DOMESTIC GROSSES". Box Office Mojo. Retrieved December 25, 2015. ^ "ANIMATION". Box Office Mojo. Retrieved December 12, 2015. ^ "ALL-TIME DOMESTIC GROSSES". Box Office Mojo. Retrieved May 27, 2015. ^ a b Nancy Tartaglione; Anita Busch (June 22, 2015). "'Jurassic World' Crossing $1B Global; 'Inside Out', 'Minions' Debut Strong – Intl Box Office Final". Deadline Hollywood. Penske Media Corporation. Retrieved June 23, 2015. ^ "'The Martian' Opens To $44.6M, To Pass $100M Globally Today - Intl B.O." Deadline Hollywood. Retrieved October 16, 2015. ^ "'The Martian' $118.5M Offshore; 'Pan' $20.4M - Intl B.O. Final". Deadline Hollywood. Retrieved October 16, 2015. ^ a b Nancy Tartaglione (July 12, 2015). "'Minions' Henchmen Nab $124M & No. 1 in 4th Frame; 'Terminator' Generates $47M – Intl Box Office". Deadline Hollywood. Penske Media Corporation. Retrieved July 13, 2015. ^ Sandwell, Ian (July 27, 2015). "'Inside Out' leads UK box office with $11.4m". Screen International. Archived from the original on September 6, 2015. Retrieved September 6, 2015. ^ Nancy Tartaglione (September 21, 2015). "'Scorch Trials' Heats Up $43.2M; 'Everest' Scales $28.8M – Intl Box Office Final". Deadline Hollywood. Penske Media Corporation. Retrieved September 22, 2015. ^ Nancy Tartaglione (August 9, 2015). "'Rogue Nation' Flies Higher in 2nd Frame With $65.5M; 'Fantastic Four' No. 2 With $34.1M Bow – Intl Box Office Update". Deadline Hollywood. Penske Media Corporation. Retrieved August 10, 2015. ^ Nancy Tartaglione (August 16, 2015). "'Rogue Nation' Revs Up $46M More; 'Man From U.N.C.L.E.' Spies $12M; 'Brothers' Shows Muscle – Intl B.O. Update". Deadline Hollywood. Penske Media Corporation. Retrieved August 17, 2015. ^ Nancy Tartaglione (September 6, 2015). "'Terminator', 'Hitman' Lead Sluggish Frame; 'Compton' Tops 5 Markets – International Box Office". Deadline Hollywood. Penske Media Corporation. Retrieved September 7, 2015. ^ Nancy Tartaglione (September 20, 2015). "'Inside Out' & 'Ant-Man' Reach New Global Box Office Milestones". Deadline Hollywood. Penske Media Corporation. Retrieved September 20, 2015. ^ "'Inside Out' Opens at No.1, Grosses P97.17-M in 5 Days". ClickTheCity.com. August 24, 2015. Retrieved August 26, 2015. ^ "Top 100 Animation Movies". Rotten Tomatoes. Fandango. Retrieved March 20, 2019. ^ "Inside Out (2015)". Rotten Tomatoes. Fandango Media. Retrieved January 30, 2019. ^ "Top 100 Animation Movies". Rotten Tomatoes. Fandango Media. Archived from the original on September 23, 2015. Retrieved December 11, 2015. ^ "Top 100 Movies of All Time". Rotten Tomatoes. Fandango Media. Retrieved August 18, 2017. ^ "Inside Out Reviews". Metacritic. CBS Interactive. Archived from the original on February 18, 2015. Retrieved August 18, 2017. ^ Christopher Orr (June 24, 2013). "Pixar's Sad Decline—in 1 Chart". The Atlantic. Retrieved June 16, 2015. ^ a b Michael Phillips (May 18, 2015). "Cannes 2015: Disney/Pixar's 'Inside Out' a return to form". Chicago Tribune. Retrieved May 18, 2015. ^ Eric Kohn (June 16, 2015). "Review: Why 'Inside Out' is a Return to Form for Pixar". IndieWire. Retrieved June 16, 2015. ^ a b Scott, A. O. (June 18, 2015). "Review: Pixar's 'Inside Out' Finds the Joy in Sadness, and Vice Versa". The New York Times. Retrieved June 19, 2015. ^ a b Christopher Orr (June 19, 2015). "With Inside Out, Pixar Returns to Form". The Atlantic. Retrieved June 19, 2015. ^ Berardinelli, James. "Inside Out". Reelviews.com. Retrieved July 4, 2015. ^ Pamela McClintock (April 22, 2015). "CinemaCon: Pixar's 'Inside Out' Premieres for Theater Owners". The Hollywood Reporter. Prometheus Global Media. Retrieved April 23, 2015. ^ Dave McNarry (April 22, 2015). "Pixar's 'Inside Out' Debuts to Emotional Crowd at CinemaCon". Variety. Penske Media Corporation. Retrieved April 23, 2015. ^ Peter Debruge (May 18, 2015). "Cannes Film Review: 'Inside Out'". Variety. Penske Media Corporation. Retrieved May 18, 2015. ^ Richard Lawson (May 18, 2015). "Pixar's Inside Out Revels in the Wonder, and Sadness, of Being Alive". Vanity Fair. Retrieved May 18, 2015. ^ Peter Bradshaw (May 18, 2015). "Inside Out review - a buoyant and sweet-natured comedy from Pixar". The Guardian. Retrieved May 18, 2015. ^ "At Cannes, the latest from Pixar and a previous Palme D'Or winner". The A.V. Club. Retrieved November 17, 2015. ^ "More than just Pixars best, Inside Out is a new animation masterpiece". HitFix. March 10, 2015. Retrieved March 4, 2016. ^ Kristopher Tapley. "2015 Movie Superlatives - Variety". Variety. Retrieved March 4, 2016. ^ Richard Roeper (June 15, 2015). "Inside Out: A Funny, Gorgeous Exploration of One Girl's Brain". Chicago Sun-Times. Archived from the original on June 18, 2015. Retrieved June 19, 2015. ^ Chris Nashawathy (June 16, 2015). "Inside Out: EW review". Entertainment Weekly. Retrieved June 19, 2015. ^ Mary Pols (June 18, 2015). "Review: Inside Out Takes a Mind-Blowing Trip Inside the Brain". Time. Retrieved June 19, 2015. ^ "Pixar and the Brain Scientists". The Los Angeles Review of Books. ^ "Inside Out - Movie Review". Common Sense Media. Retrieved August 28, 2018. ^ "All 2015 Film Awards and Nominations Scorecard". Metacritic. Retrieved January 13, 2016. ^ "Oscar Nominations 2016: The Complete List". Academy Awards official website. Archived from the original on January 10, 2013. Retrieved January 14, 2016. ^ "Pixar's 'Inside Out' Wins Top Prize at Annie Awards". Variety. Retrieved February 7, 2016. ^ Flores, Terry (December 1, 2015). "'Inside Out,' 'Good Dinosaur' Lead Annie Award Nominations". Variety. Penske Media Corporation. Retrieved December 1, 2015. ^ "Critics' Choice Movie Awards". Critics' Choice Awards. Archived from the original on December 12, 2012. Retrieved December 15, 2015. ^ "New York Film Critics Circle 2015 Awards". Indiewire.com. Retrieved December 2, 2015. ^ "41st Annual Los Angeles Film Critics Association Awards". Los Angeles Film Critics Association. Retrieved December 8, 2015. ^ "EE British Academy Film Award Winners in 2016". BAFTA. Retrieved March 1, 2016. ^ "Baftas 2016: full list of winners". The Guardian. February 14, 2016. Retrieved March 1, 2016. ^ "Årets nominerede for filmåret 2015". Danmarks Film Akademi. Retrieved March 29, 2016. ^ "'Spotlight,' 'Inside Out' Among Nominees for Italian Oscars". The Hollywood Reporter. Retrieved March 29, 2016. ^ 2016, 23 August. "The 21st Century's 100 greatest films". Retrieved September 16, 2016. ^ Dargis, Manohla; Scott, A.O. "The 25 Best Films of the 21st Century...So Far". The New York Times. Retrieved July 8, 2017. ^ Terrero, Nina (June 24, 2015). "The mind-blowing success of Inside Out". Entertainment Weekly. Retrieved January 19, 2016. ^ Terrero, Nina (January 14, 2016). "Pete Docter talks Inside Out Oscar nominations, possible sequel". Entertainment Weekly. Retrieved January 15, 2016. ^ Snetiker, Marc (July 1, 2016). "Pixar: No sequels for Ratatouille, WALL-E, or Inside Out anytime soon". Entertainment Weekly. Retrieved July 8, 2016. ^ Maddaus; Gene (June 20, 2017). "Child Development Expert Claims Disney Stole Idea for 'Inside Out'". Variety. Archived from the original on June 21, 2017. ^ "'Inside Out' Infringement Case Dismissed In U.S. Court". Cartoon Brew. February 6, 2018. Retrieved August 28, 2018.